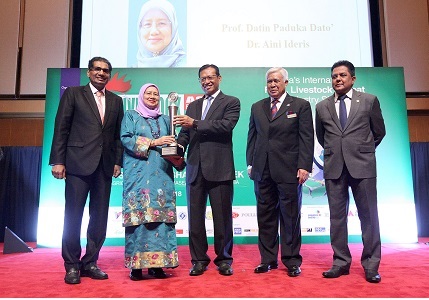 KUALA LUMPUR, April 19 - Universiti Putra Malaysia (UPM) Vice Chancellor, Prof. Datin Paduka Dato 'Dr. Aini Ideris, received the Lifetime Achievement Award - Academic & Veterinarian at the Malaysian Livestock Industry Awards 2018 here today. The award, a collaboration between the Department of Veterinary Services (DVS), the Ministry of Agriculture and Agro-based Industry of Malaysia and livestock and veterinary associations, was introduced in 2001 with an aim to recognise the outstanding performance of individuals and industries in enhancing the development and improvement of livestock-related industries in Malaysia. The award ceremony was held in conjunction with the Livestock Asia Expo and Forum at the Kuala Lumpur Convention Center (KLCC) here.